When I pulled the lens out of its box, I expected to be greeted by a monstrous front element. The lens is slightly more compact than I’d envisaged and the front element is smaller than those we’re typically greeted by on fast full-frame wideangle zooms, such as Nikon’s AF-S Nikkor 14-24mm f/2.8 G ED. Squeezing such a complex arrangement of elements and groups into a relatively compact package makes it quite deceptive in terms of weight. It’s a lens that’s heavier than it looks, and the fact it weighs 950g means it’s almost 300g more than Sigma’s 24mm f/1.4 DG HSM | A. 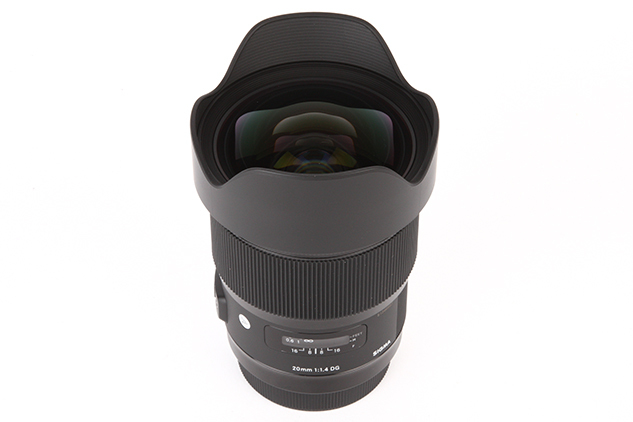 The build quality is comparable to other lenses in Sigma’s Art line-up and the construction of the barrel is made from a mixture of metal and plastic. The section of the barrel adjacent to the camera is made from metal, just like the large manual-focus ring at the front of the lens, whereas the middle section of the barrel and lens hood are formed of high-quality plastic. The only issue that might concern some, as far as the build quality goes, is its lack of weather sealing. Although it will happily survive a few raindrops, it’s advised to stow it away during a persistent shower. The permanently attached lens hood helps to shield the glass from any accidental bumps and scrapes, but the bulbous front element does prevent screw-in filters being used. Although it has been rumoured that the Sigma 12-24mm f/4.5-5.6 DG HSM II adapter ring Lee Filters produces for its SW150 Mark II system might fit, we tried it only to find that it doesn’t. Regrettably, no filter adapter was available at the time of testing, but Lee Filters disclosed to AP that it would look into creating one if there’s enough demand, but it wouldn’t arrive for at least a couple of months. In terms of its operation, the manual-focus ring operates fluidly and functions across its focusing range in just over a quarter of a turn. It falls nicely to hand and the same can be said for the large AF/MF switch that juts out from the side of the barrel and is easy to locate with your thumb. This switch offers a reassuring click, and the white background that’s revealed behind the switch when it’s set to AF acts as a visual reference of where it’s set to in low light.